OUR ROOMY 615 SQUARE FOOT GUEST LODGING IS A CHARMING AND COMFORTABLE ACCOMMODATION SUITABLE FOR UP TO FOUR GUESTS. COMPLETELY FURNISHED, IT BOASTS A FULL-SIZED, AMPLY EQUIPPED KITCHEN (SAVE $$$ BY COOKING YOUR OWN MEALS) WITH MICROWAVE, COFFEE MAKER & TOASTER.....COLOR TV WITH SURROUND SOUND, VCR WITH 200 PLUS VIDEO LIBRARY, STEREO RADIO, ALARM CLOCK.....TWO QUEEN-SIZED FUTON SOFA/BEDS FOR A MORE NATURAL LIVING ENVIRONMENT.....FULL BATH, HAIR DRYER, IRON & IRONING BOARD, WASHER & DRYER IN ROOM, OLD-FASHIONED DECORATIVE WOODSTOVE, CERAMIC TILE FLOORS, THE COMFORTS OF CENTRAL AIR & HEAT, CEILING FANS...A COVERED CARPORT AND PORCH, TEXAS-SIZED BARBEQUE & CAMPFIRE RING. 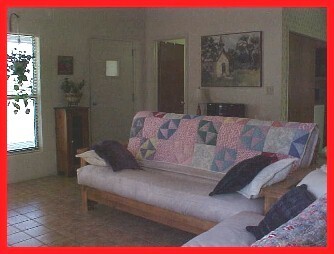 CHECK OUT OUR COMPARABLE RATES WITH LOCAL HOTELS, MOTELS, DUDE RANCHES, CABINS, BED & BREAKFASTS. ESPECIALLY EQUIPPED FOR THOSE LOOKING FOR EXTENDED STAYS, YOU CAN'T BEAT THE BAR M'S DELUXE FEATURES AT AFFORDABLE RATES. Email us at mtbarmranch@aol.com or click on the horse below to contact the "Bar M Ranch"
"BAR M GUEST RANCH, LLC"
USA hotels and vacation rentals. A1Touristguide directory of USA accommodations. Search by state, city and accommodation type.